The Uzebox is an old school gaming console hardware designed for today’s hobbyists. 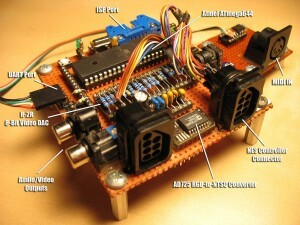 It is based around an ATmega MCU and an RGB-to-NTSC (or PAL) converter chip. The system has 4kB of RAM and 64kB of FLASH. The system can display 256 colours on screen at any given moment. The software kernel is built for game development and employs some old tricks to make such a limited system perform. For instance, instead of only providing a pixel-based framebuffer, all graphics can be built from tiles and sprites. This frees up a considerable amount of RAM. On the I/O side the Uzebox supports NES controllers and optionally, MIDI IN. For storage, an SD-card is used. This makes it easy to swap games, etc. Being originally built for the NTSC (US) market, there now is a European (SCART-based) version. It is sold both as kits or preassembed. For those of you who want to start to play right away, there even is an emulator available for download. This entry was posted in AVR, Electronics, Platforms, Projects. Bookmark the permalink.